languagehat.com : TRACES OF A LOST LANGUAGE. TRACES OF A LOST LANGUAGE. Exciting news (if you’re the type to get excited about lost languages): an archaeological project at Magdalena de Cao Viejo in Peru in 2008 excavated a paper document (remarkably well preserved in the dry climate) with the names of numbers in an unknown language that may be Quingnam or Pescadora (or both, if, as some think, they’re the same). Here‘s the paper by Jeffrey Quilter, Marc Zender, Karen Spalding, Régulo Franco Jordán, César Gálvez Mora, and Juan Castañeda Murga, “Traces of a Lost Language and Number System Discovered on the North Coast of Peru” (American Anthropologist 112:3, September 2010); you can read a brief press release about the paper from Harvard’s Peabody Museum, and watch a three-minute video in which Quilter discusses it. The paper starts with a description of the document and its discovery (and some theorizing about how the numbers came to be recorded), proceeds to a discussion of what we know about the indigenous languages of the North Coast of Peru, presents the number list itself, and tries to identify the language. The conclusion says, “We do not definitively state that the number list documents previously unrecorded words from the Quingnam–Pescadora language(s), but we believe that it remains a viable possibility. We can definitively state, however, that this language is not Mochica and that its speakers must have had at least some contact with Quechuan speakers (as revealed in the borrowed vocabulary for several numbers)—albeit of a punctuated, symmetrical, and probably remote nature.” Many thanks to Kattullus for his MetaFilter post, which brought the discovery to my attention! I forgot to include the Magdalena de Cao Viejo excavation website in the post, it provides more context. Speaking of decoding, I’m reading Breaking the Maya Code by Coe, and it’s well worth it. Only trouble is that I want to reach through the pages to smack a great many arrogant Mayanists upside the head for their utter arrogance and ignorance of linguistics. @Sili: It’s not only in Maya studies that “dirt archeologists” dismiss any other approach. Some of these fellows are trying to say there’s no “material evidence” for the Dorian invasion. If inscriptions in a very distinctive dialect, distributed in a pattern which plainly couldn’t have developed in situ, aren’t material artifacts, I’d like to know what they are. Wow, how can the paper have lasted that long? It makes me wonder, in case of disaster or the depredations of time, how much e-literature will be permanently lost…. On the other hand, that we should even consider the extirpation of the written word is worth noting. The speaker is an involuntary time traveler from 1939 Rome who finds himself stranded in the year 535. Barbarian invasions are consequently much on his mind, and his aim is to prevent the darkness of which the title speaks. The novel is a classic of alternate history, along with A Connecticut Yankee and Ward Moore’s Bring the Jubilee. Some of these fellows are trying to say there’s no “material evidence” for the Dorian invasion. If inscriptions in a very distinctive dialect, distributed in a pattern which plainly couldn’t have developed in situ, aren’t material artifacts, I’d like to know what they are. Well, there’s no evidence that the Dorians invaded from outside of Greece, as textbooks claimed for decades (and probably still do) without any evidence that I know of. Oh, sure, the Mycenaean culture ended, so it must have been destroyed by barbarian hordes from far away, the closer to beloved central Europe, the better, right? Grrr. @David: Thanks for leading me to sources that complicate my long-ago-learned view of the matter. I should perhaps reserve my pique for Colin Renfrew. Well, it depends on what you mean by Greece. 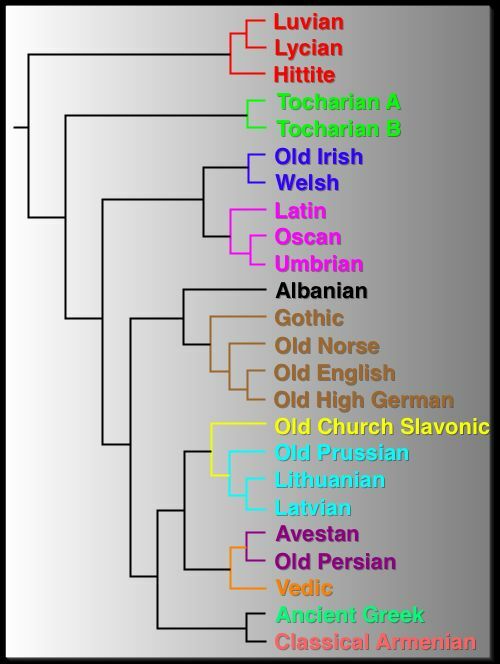 Proto-Greek, meaning the actual common ancestor of the known dialects as distinct from our reconstruction thereof, need not have been spoken in Greece at all, and in fact we have little evidence of where it was spoken. The CPHL effort (Ringe, Taylor, Warnow, Nakhleh, et al.) claims that part of the Germanic anomaly (PDF) in the IE tree can be explained by a crossover with proto-Italic, which sounds strange enough until we realize that proto-Italic might have been spoken in central Europe before moving south and differentiating. While we’re off the subject, I found Lest Darkness Fall to be a clever but lifeless rewrite of Connecticut Yankee minus the irony and plus a lot of naive technophilia. Not to mention de Camp’s notorious mistake involving the Gothic vocative. I grant the point about irony: Twain was notoriously a pessimist on a grand scale, whereas de Camp was a small-time optimist or meliorist. As Heinlein said, de Camp never destroyed a galaxy and only rarely and excusably rescued the human race. There are also typos in the Gothic, but I’d guess someone other than de Camp was responsible for those. Sprague did point out some years later that he had made a grammatical mistake, though. Frijond, as well as atta ‘father’, used elsewhere in the book, are in the nominative case (as if they were the subject of the sentence) instead of the vocative case (used for addressing people directly). But frijond is indeed the vocative; the nominative is frijonds. Says so right here in my Gotische Grammatik (Braune/Ebbinghaus). Furthermore, atta is an n-stem like guma, for which Braune/Ebbinghaus don’t list a vocative, which implies none is attested; I see no reason, however, why it wouldn’t be atta. I say de Camp has been slandered! Well well well. I forget just who it was that told de Camp he’d gotten it wrong, but it was someone he thought was an expert — and Sprague wrote popular articles on linguistics that are still readable today, notably “Language for Time Travelers,” which is about time travel to the future and what might have happened to English when your hero gets there. His very first published short story, “The Isolinguals”, has a language-related theme: the inhabitants of a city revert to speaking the languages of their ancient ancestors, leading to utter chaos in which the eponymous roving gangs consist of people who speak the same language, or similarly enough to communicate at all. Here’s something I noticed years ago but never put on record anywhere. A minor character, mentioned just once in LDF, is Metellus the Saddler. At around the same time, de Camp was writing a story called “The Gnarly Man” about an immortal Neanderthal. One of the Homo sapiens character in the story is named Matilda Saddler. Joke, or coincidence? We’ll never know — de Camp died in 2000. As I recall, what de Camp wrote was “Ho, frijonds!“–definitely the nominative. It was the first Gothic word in the book too. When his error was pointed out to him, after all the research he’d done–an error in the only attested Gmc language with a vocative, in the only declension with a form distinct from the nominative, and in the first Gothic word in the book–I’ve read he threw up his hands and decided to use only invented languages in his subsequent fiction. Last comment on that: Perhaps the edition of LDF you were using was a revised one. Back to the post topic: How wonderfully strange, almost like a NYT bestseller, that a new language text should be found after such a chain of circumstances–let alone a number list compiled by someone who knew what he was doing. Perhaps the edition of LDF you were using was a revised one. It would seem so, and I’m impressed and pleased that they bothered to correct the error! I’d guess that de Camp insisted on the correction. The typos, however, persist even in the latest editions: *faurthei for faurhtei ‘fear’ (cf. German Furcht), *alai for allai ‘all’ (cf. English all), *skalljans for skattjans ‘money-lenders’ (cf. older English scot ‘payment’). I’ve updated my blog post, in any case, as well as noting that the grammar I used was Joseph Wright’s.